I absolutely couldn't wait to show you these nails as I adore them. Rachael came in for her nail appointment and I know her so well as her tastes are very similar to mine. I had laid out all of my recent colour pop ideas which must be about 25 colour pops and she said "there's two I love the most, guess which ones" and I hilariously was able to pick the exact two that she adored. 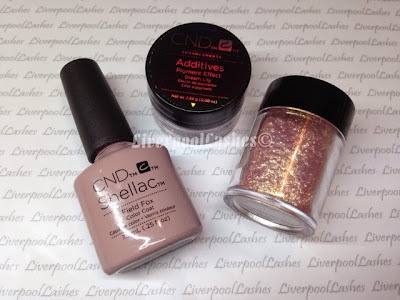 I knew it would be a toss up between CND Shellac in Creekside or Field Fox. If I was a betting woman I'd have said Creekside but luckily I'm not as she went with Field Fox over her enhancements. One of the colour pops she has picked out as a favourite was from the "Focusing On Creekside" blog post (click here if you missed it) where I had drawn a heart in glitter dots. She wanted this heart over Field Fox which I used CND Additive in Dream Lily for. She also liked the fade I'd created over Lecente Neptune so I suggested that she could have that or one of the ideas I did on Friday's 3D Textured Nail post (click here for that) but using the colours she liked. 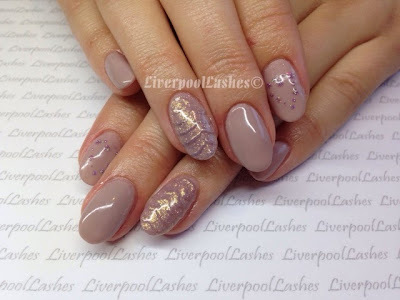 Rachael always says her new set are her favourite so needless to say, she's convinced that these ones definitely are! Super pretty!! Love the colour and designs! !